« All the weird and wonderful stories are piling up at once. I am pleased to report that Arsenal have agreed our design for a banner that says ‘Football should be an art’ – the shortened version of Mr Wenger’s phrase “I believe the target of anything in life should be to do it so well that it becomes an art,” which has appeared on our home page for the last five years or so. I have now sent the design to a manufacturer to be made in accordance with the club’s guidelines. At the moment I am unsure of the timescale but I’m hopeful that this could be in place for the Emirates Cup (or the beginning of the season at least). It has costed out pretty much as we estimated at around £250. 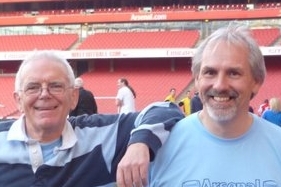 Tony and I are aware that many readers have indicated a desire to chip in to help fund this and so we are proposing that if anyone in the Untold family wants to help you should send a donation of £5 to Untold Arsenal. In both cases please do write as a reference BANNER and your name. (Just in case you are wondering, Websites and Blogs Ltd is a company owned by Tony, set up some years to own a variety of sites that he has developed over time). The names of everyone who donates will be put on a Roll of Honour page published on Untold Arsenal which will be available permanently, and will also be published in one of our regular reports as well. When you have sent the money please email Tony.Attwood@aisa.org to say that you have sent the £5, confirm the method, and give us your name exactly as you wish it to appear on the Roll of Honour of people kind enough to support this venture. We will also post pictures of the banner on the site when it has been installed at the Emirates. 25 June 2007: After 254 league games and 174 goals Thierry Henry transferred to Barcelona for €24 million in a deal that ultimately cost the Catalan club over £250,000 per match. Also quoted as 23 June in some quarters. 1. How do I contribute from Nigeria? 2. Should there be excess funds that could make additional banner, please let ‘Untold Arsenal’ and ‘Arsene Wenger’ feature prominently on them. That is a very cool banner to be put up in our stadium. Is pound 5 the upper limit or the lower?? Will do the needful. Thanks , and good job ! @Arsenal 13 – £5 is the upper limit, we want lots of contributors so we thought it best to say ‘give us a fiver’ instead of opening up to larger amounts. By the way the banner man says it should be made NEXT WEEK! Thank you Tony for untold Arsenal, thank you the Untold Intelligentsia for your unalloyed support for the humanist coach. Damilare: Where are you in Nigeria? Can we promote untold in Nigeria…!? Many Arsenal fans needs untold for football sanity and comfort. Expert-riates; These are fans of other club who hated Arsenal with passion and also claim to know more than we the true fans of Arsenal. YES WE CAN…I’m in Lagos too (Omole Phase 2) Isheri but I work from time to time in the North. If Walter and co can do it in Belgium, why not us in Nigeria. Love your work fellas! Fiver proudly deposited. Duly paid. Can’t wait to see the banner! Paid, can’t wait to see it in place. Great to know this. It is well and truly a great achievement for this forum. I have come to know you all by your usernames and love all of you for Arsenal and Arsene’s sakes. Like Dmilare and the Apologist, am in lagos too(Ebute metta) and would certainly love to be part of untold Arsenal Nigeria. Thanks. Late to the party again but payment made. Glad to be able to contribute to this. @Damilare/Apologist/Herphyz I am in Lagos (Abesan, Ipaja) as well. “Like play, like play”, the number of people interested in the formation Untold Arsenal Nigeria is growing … we will get there. Reach out guys when it is time to kick of the movement. @The Apologist, Damilare, I stay at ajao estate. Close to the airport. We should push the movement. Lots of people lost out here. I think there you have it Mr Attwood and Broeckx. We want our own Untold Arsenal, Nigeria, We want our own Untold Arsenal. Please how do we proceed from here Tony/Walter. Not forgetting to address the issue of how Untold Arsenal Nigeria would partake in the banner fivers. Apologist/Herphyz/Gideone/other UA Naija readers…Watch this space. I paid the £5 via Paypal linked to my GT and Diamond bank accounts. Have you tried that? I’ve tried to open a paypal account but Im having difficulties signing on. I confess ICT tech is not my strong point but this is particularly knotty. I have First bank, Stanbic IBTC and Skye bank account. Can you put me through please? Am in with that UA Nigeria thing guys. I live and work in Ibadan and will be glad to participate. Well done Blacksheep et al. You are like angels from heaven. I think this season will usher in many good things for us. And I daresay, many unpleasant moments for our detractors. Stan The Man, nice to know that you are in. Things can only get better for Arsenal. A big thanks to Gideone for his assistance.